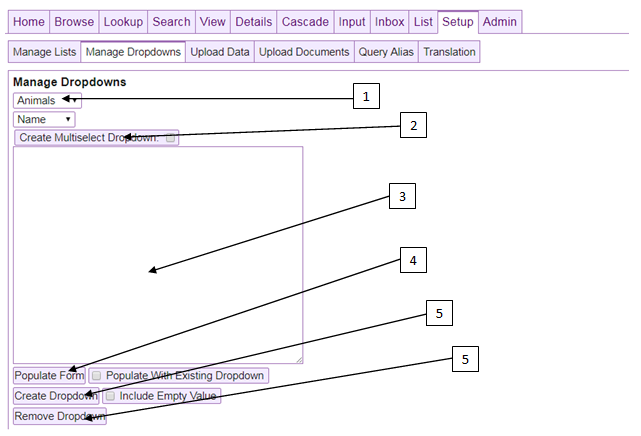 The Manage Dropdowns module is for creating, updating, and removing the dropdown lists used to define standard input values when inputting data. This module is accessible through the Manage Dropdowns button on the left of the Setup tab and is only available to users with Superuser or Admin permission. These two selectors are for choosing the layout and column name that the dropdown is to be created on, or if the dropdown exists, the layout and name of the column that has the dropdown to be altered or removed. The multiselect checkbox makes the dropdown into a multiselect dropdown. This will save the values in a comma separated list by default. This is the area where the dropdown options appear. The dropdown items must be on separate lines. This is the button to populate the dropdown item area. It will populate with the existing dropdown if the checkbox option “Populate with Existing Dropdown” is checked. It will populate with all values in the dropdown and all data values in the column chosen distinctly and in alphabetical order if dropdown does not exist or the checkbox option is not checked. It will also let the user know whether there is an existing dropdown via the return message. It will not include values from archived records. The Create Dropdown button creates or updates the dropdown. If “Include Empty Value” is checked it will include an empty value as the first option. The Remove dropdown option removes the dropdown from the column allowing any value to now be inputted into the column.